Since 2003, the Building Regulations now require provision must be made to reduce noise problems traditionally encountered in schools. These new rules apply to all new schools and all school buildings are now subject to on-site inspections. This is because recent studies have shown that children are suffering due to their inability to hear clearly what is being said in most teaching areas. Part E of the 2003 Building Regulations now include school buildings for installation of sound absorbing materials to reduce classroom reverberation of noise problems which can affect a child's ability to learn. "Each room or other space in a school building shall have the acoustic conditions and the insulation against disturbance by noise appropriate to its normal use"
● To provide a regulatory framework for the acoustic design of schools in support of the Building Regulations. ● Give supporting advice and recommendations for planning and design of schools. ● Provide a comprehensive guide for architects, building control officers, building services engineers, clients and others involved in the design of new school buildings. ● Speech cannot easily be understood due to excessive reverberation. ● The design and shape of the classroom may distort speech. ● Lessons may be disturbed due to noise being heard from outside of the class. Reverberant sound or 'echo' is created by sounds such as speech bouncing off surrounding hard surfaces. This has the affect of distorting the sound often making it difficult for pupils to comprehend what the speaker is saying. This results in speech reaching a pupil's ears from many directions and becoming mixed with other syllables making any speech sound unclear. 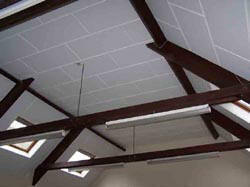 If there is too much reverberation then sound absorbing materials will be required to reduce it. 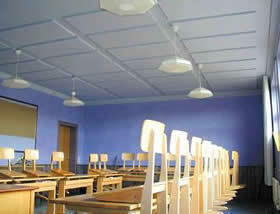 This is usually simple to address and is resolved by installing Echosorption Plus acoustic tiles onto the ceilings. Reverberation time is the time taken for noise to fade away sometimes referred to as the 'decay rate'. This usually takes anything up to eight seconds depending on the amount of sound reflection there is in the room. A large room such as a sports hall or assemby room will have much longer reverberation nearer to eight seconds whereas a smaller room with lots of soft furnishings will have a much lower reverberation time. BB93 specifies the reverberation times now required for all teaching areas from classrooms to larger assembly halls and dining rooms. To address any reverberation problem in rooms, sound absorbing insulation is required. This normally takes the form of acoustic tiles which are easily bonded to the ceiling. In severe cases, additional sound absorption is required on the walls. This is often the case in sports halls, dining rooms and assembly halls. If this should be required, our Wallsorption sound absorbing wall panels would normally be used. Rooms experiencing high levels of noise usually require a large amount of sound absorption so it is important the correct amount and type required is accurately assessed. It is advisable to talk to us to discuss the best solution for the calculation of the right number and best products for the room in question. The size and shape of the room is very important and the size will affect the level of reverberation experienced so it is important we are able to calculate the correct solution for you. Below is an indication of the minimum and maximum reverberation times now allowed in each teaching area. These are versatile spaces used for a wide variety of functions in schools ranging from school assemblies to sporting activities. Solutions to reduce noise reverberation in these areas is to install Wallsorption sound absorbing panels on the walls and/or Echosorption Plus acoustic tiles on the ceiling depending on the size of the hall. 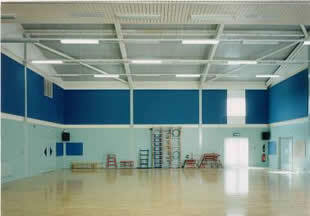 Sports halls are traditionally designed with hard floors and walls to reduce impact damage. There is always a lot of reverberation (echo) in these areas due to the sound bouncing off all of these hard surfaces making speech more difficult to understand unless situated very close to one another. This problem is easily resolved with the installation of Wallsorption sound absorbing panels high up the walls where impact damage will not be a problem. As classrooms are the most numerous and important in schools, it is essential that all speech in these areas is easily understood. Our solutions for these areas is the installation of Wallsorption horizontally along the upper sections of the walls along with Echosorption Plus acoustic tiles on the ceiling. 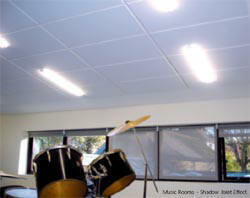 Music rooms will always be more difficult to insulate due to the higher levels of sound generated in these classrooms. Our Wallsorption sound absorbing panels installed onto the walls along with our Echosorption Plus acoustic ceiling tiles will normally absorb these sounds. For lower frequencies absorption, the Echosorption Plus can be fixed onto battens creating an airspace between the tile and the ceiling. 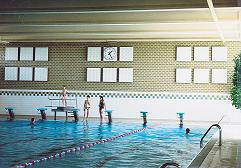 All of the hard surfaces in pool areas create large amounts of reverberation which often make it difficult to clearly hear instructions given by staff. Sound absorption is a definite advantage in these areas and our Echosorption Plus can be applied to the upper walls to reduce reverberation from those surfaces.